Robert Graham was born in 1961 in the poorly deprived area of Aston in Birmingham, where the sight of chickens hanging from garden trees with their throats cut was a common occurrence. Moving to Wales at the age of six months old, he describes himself as a true Welshman; even though his father was Scottish and his mother Irish. After several years of continually moving home and school, they eventually settled in a newly developed council estate on the outskirts of Cardiff. It was there that Robert discovered a passion for the great outdoors, often disappearing for whole days in his search for adventure. At thirteen he joined the navy cadets, and into a world that took him away from fighting in gangs and stealing from shops; the latter resulting in a spell with drunks and thugs in a police cell. At sixteen he went on to join the navy, travelling the world and experiencing firsthand the horrors of war. Falklands Veteran Rob Graham left his beloved Wales in 2013 in a bid to cycle to the other side of the world. 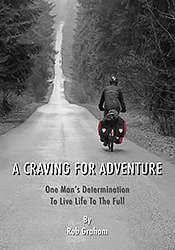 The true story tells how he finds himself a target for muggers, witnesses the reality of human kindness and pushes his body beyond the realms of physical endurance; all in his quest for adventure. He also becomes torn between the love for his sons and the woman he wants to spend the rest of his life with. Combining the adventure with a challenge, he attempts to cycle 20,000 kilometres, through twenty countries in just ten months. Never one to take the easy option he rides solo and unsupported also. It’s a challenge many told him couldn’t be done and where there were numerous reasons why he might fail. An inspirational tale of self-discovery, it is full of humour; danger, conflict and an abundance of adventures. Along the way he is confronted by his past and meets an array of colourful characters.